The Clement Canopy is located at Clementi Avenue 1 (D05), opposite Nan Hua High School and next to NUS. More info here. Those looking for luxurious seaside living will find themselves right at home at Seaside Residences, located near the East Coast Park. More info here. Linked directly to the Queenstown MRT station, this high-rise project boasts superior views and value. More info here. Buying a home is probably the biggest financial commitment you will ever make in your lifetime. Which is why, it needs to be carefully planned. Before you even start your hunt for a new home, you should first work out the details of what you can afford as well as what you need to pay for. Importantly, you also need to consider how much you can borrow. Below are some guidelines on buying HDB flats, executive condominiums and condos in Singapore, as well as the loan amount you are eligible to borrow to facilitate your home-buying decisions. 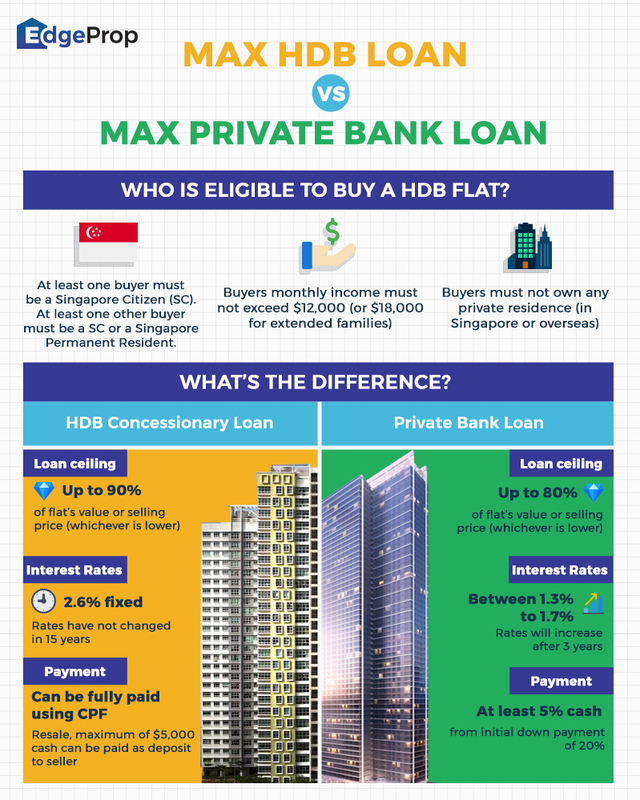 If you’re looking at buying a HDB unit, the maximum loan you can obtain will depend on whether you’re using a HDB concessionary loan or a private bank loan. For HDB home loans (which only covers HDB flats and not Executive Condominiums), you can borrow up to 90% of the flat’s value or the selling price (whichever is lower). Meanwhile, the loan ceiling for bank loans is at 80%. HDB flats come with a maximum home loan tenure of 30 years. However, if you have a loan tenure that stretches beyond 25 years, then your lending limit may be capped at 60% of property value or selling price. While it offers a higher margin of finance, HDB home loans also come with higher interest rates. They currently stand at 2.6% and has been consistently so in the last 15 years. On the other hand, bank loan packages come with interest rates of between 1.3% and 1.7%, but will increase exponentially after three years.